Netværk for Flygtninge og indvandrere i Gladsaxe deltager selvfølgelig også. Du er velkommen til at komme og få en snak med os, uanset om du er flygtning/indvandrer eller måske har lyst til at blive frivillig. Du finder Netværket i Telt 5 ved Buddinge Centret fra kl. 13.00-17.00. På Gladsaxedagen kan du bl.a. opleve børneteater, musik, debat og en tur med en lille letbanevogn. Og der er koncerter med både Thomas Buttenschøn og Michael Falch. 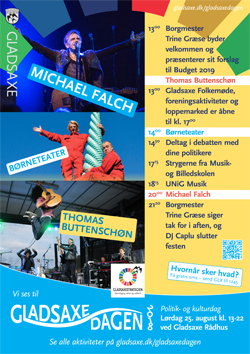 Gladsaxedagen 2018 (The Gladsaxe Day) takes place Saturday August 25, it is a day with politics and culture. There are activities in the Town Hall area from 1.00-10.00 p.m. View the programme here: Program for Gladsaxedagen 2018 (only in Danish). Of course the Network for Refugees and Immigrants in Gladsaxe participates in Gladsaxedagen. Please come and have a chat with us if you are refugee or immigrant – or if you want to join us as a volunteer. You can find the Network in Tent 5 at Buddinge Centret from 1:00-5:00 p.m.
At Gladsaxedagen you can experience children’s theatre, music, debat and a ride in a small ‘letbane’ coach. There are also concerts with both Thomas Buttenschøn and Michael Falch. Read more about Gladsaxedagen 2018 at www.gladsaxe.dk/gladsaxedagen (only in Danish).